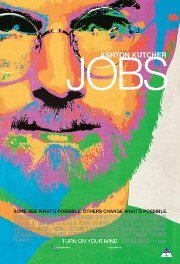 This biopic showcases the highlights of the late Steve Jobs, following his career from his college days, Atari, the early Apple I and II, through the troubles at Apple, his dismissal, reappointment, and the succesful launch of the i-range of products. Comments Themes are mostly inspirational and fairly complex, but the story of success of Steve Jobs, founder of Apple Computers is an uplifting one, inspiring hard work and going after one's vision. Rather more mature is the brief theme of his denial of paternity.